With Primary Day a little more than a week away in Minnesota, candidates are doing all they can to shore up support. With MNGOP endorsed candidate Jeff Johnson in a tough battle with Tim Pawlenty for the Republican nod for governor, Johnson is obviously attempting to shore up as much statewide appeal as possible. Let's see. In seeking reelection to a fourth term in Congress back in 2012, Michele Bachmann's campaign and other Independent Expenditures cumulatively spent approximately $12 million to eek out a 1.2% margin of victory in the most conservative Congressional District (the Sixth) in the state of Minnesota. Sensing that she was wearing out her welcome, Bachmann chose not to run in 2014, thus ending her career in electoral politics. 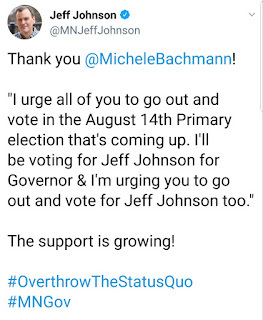 If Bachmann is indeed persona non grata in a venue such as Minnesota's 6th CD, I'm highly skeptical that she has much appeal to GOP primary voters statewide. 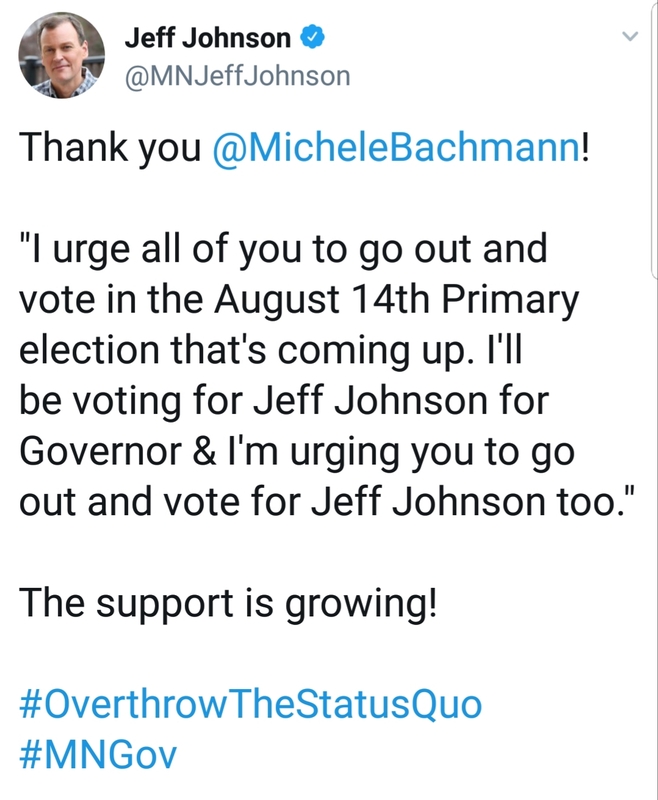 Again, Johnson touting this endorsement does little to nothing if the goal is to sway support away from Pawlenty or "Undecided." Sorry.